The ones in the photo are not finished - they will definitely get a feather in a way or another - but they already have a bit of personality and wanted to be seen, I suppose. I have quite a few, not as elaborated wool vessels that I made during the years. I like to have them around the house, to contain little crystals, small treasures I find…a couple hold a part of my feathers collection, others are used to keep my everyday jewelry safe when I take it off. I like that they make me think of nests. I like their softness and organic beauty. This last batch is definitely more ornate, with the glimmering glass beads, and I like to imagine little fairies playing around them, full of glee. Speaking of nests and birds…I have been beading. 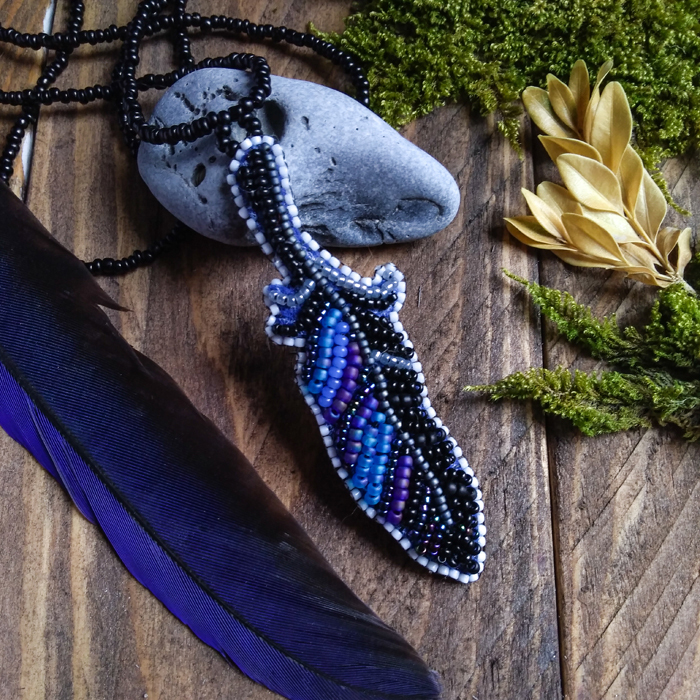 In between the more time consuming pieces, I made this little blue feather pendant, that I am offering right now as a gift for the giveaway I am holding on Instagram. Don’t you worry though, I have a giveaway planned for the blog and newsletter too, it’s going to be soon! And speaking of frustrating things…this is, so far, the only piece I made with the Scarabs i carved recently. I was actually working on another piece just this morning, and of course, once again, everything went wrong - the carving, the melting, the soldering - until I decided to call it a day. Here is to hoping this flunk will pass soon! Anyway. The first of the Scarab pieces. I had to start with Quartz, because that’s my favorite stone. The wings here are movable, they are tucked behind the body and can be opened up. I carved a slightly different texture on each side of the wings, and I scratched-carved the surface below the stone as well…the effect is beautiful when it moves in the light, and I am happy of how it turned out. I have also been working on some other concepts, and the only thing that is clear for me so far is that all of this work needs to be released togheter as a sort of collection. The nests that represent both safety and being open, accepting. The Winged Scarabs for transformation - for spreading your wings and embracing your potential. A few pieces, not ready to be shown right now, are a conversation about growth - about the tender sprout being brave enough to grow. There are stories of seeds in my heart - a revisitation of my seed ring from a few years ago. There are mantras flowing through my lips of change and the wisdom to accept it. Thoughts of rocks and mountains. All of these ideas and pieces are interwoven, so, even if I don’t do it often, I know I have to go for a collection release this time around. I still don’t have a date set, but I suppose it will be around the end of April or the first days of May…I will keep you posted. How is this change of season going for you?